Among the companies signed up to this event are KBC Bank, Citco Fund Services, Morgan McKinley and Hibernia Evros. 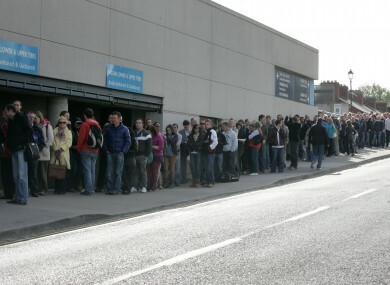 The queue for last year's Jobs Expo. OVER THE PAST two years, a number of exhibitions advertising jobs abroad have become sold-out events across Ireland but next month’s Jobs Expo claims to have hundreds of home-based positions up for grabs. The jobs fair, organised for Friday 6th and Saturday 7th September in Dublin’s Croke Park and Tuesday 10th September in the Silversprings Moran Hotel in Cork, will have over 100 recruiters from both Ireland and international destinations. Organisers say the free event will see more than 500 jobs on offer (based across Ireland and other countries) and some companies will be conducting interviews with candidates on-the-spot. More than 200 of those positions will be based in Ireland, a spokesperson told TheJournal.ie. KBC Bank is hoping to fill 40 to 50 roles including underwriters, credit advisers and vacancies in retail and personal banking operations. VM Ware, a global firm in virtualisation and cloud infrastructure, are seeking to recruit about 15 people for its Cork office. Flawless Market are on the look-out for more than 30 sales representatives in the Cork and Limerick area, while Starwood Hotels & Resorts Worldwide need about 20 call centre staff who would be based in Cork. More jobs for Cork as HiberniaEvros IT seek up to 15 engineers, developers, project managers, enterprise system administrators and consultants. Back to the capital, Field Management Ireland are on a recruitment drive for 60 full-time roles in residential sales and management. Also confirmed are 20 positions at Morgan McKinley in recruitment research, consultation and management. Earlier this year, thousands of jobseekers attended a similar exhibition and, last year, the Working Abroad Expo had to shut its doors early because of overcrowding. Advice from life coaches, visa experts and Canadian immigration will also be available at the event. Email “Jobs Expo says it has more than 200 Irish positions on offer”. Feedback on “Jobs Expo says it has more than 200 Irish positions on offer”.